An expression of happiness, light-heartedness and gratitude. The Three of Cups is the perfect card to accompany us this September. The card is an expression of happiness, light-heartedness and gratitude that presents itself and is experienced at its most during the time of the harvest festival. 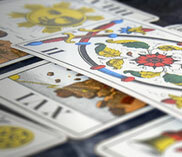 The card shows that we have achieved or received something wonderful and worthwhile and are happy, thankful and content. It shows us this is a time of celebration, friendship, creativity, abundance and harvest. The three young maidens on the card dance in a circle holding up their golden cups, toasting the abundance of the fruits of the earth. They however are not alluding to spring, but to late summer, early autumn and the harvest festival — shown by the fruit and vegetables lying at their feet. Each woman wears a laurel wreath on her head, which is a symbol of success going back to Ancient Greece, where they were awarded to victors of the ancient Olympics and acclaimed poets. If the Three of Cups turns up in a reading, it is a sign of good times ahead and celebration — at least on an emotional, creative or spiritual project, that will join at least two people together, creating a transformation that will be worthwhile and bring success.